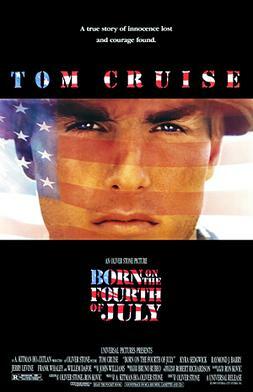 Born on the Fourth of July is a 1989 American war drama film based on the 1976 autobiography of the same name by Vietnam War veteran Ron Kovic. It is a dramatization of Kovic's life, primarily depicting his tours of duty during the war, his paralysis, and his transition to anti-war and pro-human rights activism. Directed by Oliver Stone, and written by Stone and Kovic, the film stars Tom Cruise in the leading role, alongside Kyra Sedgwick, Raymond J. Barry, Jerry Levine, Frank Whaley and Willem Dafoe. It is the second installment in Stone's trilogy of films about the Vietnam War, following Platoon (1986) and preceding Heaven & Earth (1993). Last bumped by jfko6 on Tue Jan 08, 2019 4:52 pm.